Battery D, 5th U.S. Artillery, in Action. U.S. Military Telegraph Construction Corps. New technologies developed in the mid-nineteenth century had a dramatic impact on military engagements during the Civil War. Samuel F. B. Morse’s telegraph, operating in the U. S. since 1844, proved to be a powerful means of communication. Gardner’s captions provide fascinating detail about the construction and use of the telegraph in the field. 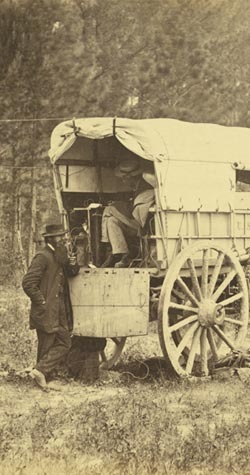 The figure standing to the left of the field telegraph wagon in David Knox’s photograph, plate 73, Field Telegraph Battery Wagon (right), is James Gardner, brother of Alexander Gardner, and contributing photographer (see plate 63, Breaking Camp). Ironically, signaling—an ancient form of communication—proved itself just as crucial to military operations as the humming telegraph wires, as the text accompanying Plate 22, Signal Tower. Elk Mountain, Overlooking Battle-field of Antietam, demonstrates. The wet collodion, glass plate negatives used to take these photographs required long exposures of 20 seconds to five minutes. Split-second movements could not be captured, which accounts for the many ghost images of subjects who had moved during the exposure. The long exposure time needed partly accounts for the presence of only one active combat scene in the Sketch Book: Plate 31, Battery D, 2nd U. S. Artillery in Action.